This French city of Limoges would probably remain unknown to the world if it were not for the amazing porcelain it produces. Located in the central region of Limousin, the city of Limoges has a very rich history dating back to the Roman empire. Remains of a Roman amphitheater as well as many edifices from the middle ages and renaissance make Limoges an interesting destination for anybody interested in history. However, what sets Limoges apart from other historical cities in France is its porcelain industry. A few decades before the French Revolution, supplies of kaolin clay were found near Limoges. The exact type of kaolin made it possible to produce fine porcelain to compete with the popular pieces made in China at the time. The Limoges porcelain was delicate and very white, almost translucent, making it extremely desirable. First commissioned by the king Louis XVI, the manufacture of Limoges porcelain gave birth to various companies after the revolution. Names include Bernardaud, Raynaud, Haviland or Philippe Deshoulières. The Deshoulières group (headquartered near my hometown of Poitiers) is one of the most renowned porcelain manufacturer since it opened in 1826 and is famous for its contemporary designs. We chose a beautiful, yet very affordable, line of canapé plates to carry in our collection. The canapé plates are six inches in diameter, perfect for dessert, salad or hors d’oeuvres served around the couch (canapé means couch in French). They come in a beautiful lavender gift box, are dishwasher safe and adorn the genuine “Porcelaine de Limoges” stamp. Each has a theme, French Castles, Wine and Cheese, Merchant Row, St Tropez Beaches, Herbs, and Walk in Provence. They make a very thoughtful gift and they are the perfect way to treat yourself to the real Limoges at a very affordable price. Until the end of August, all our Deshoulières sets are 10% off! Use coupon code LIMOGES in the shopping cart or stop by our boutique in Tustin. P.S. Read about our trip to Limoges and the porcelain factory tour we took! We’re a Favorite Place on Google! Google chose us based on the number of times people found our business listing and clicked on it for more information. Fewer than 250,000 businesses across the United States were chosen as a Favorite Place and sent a QR bar code. Merci beaucoup to everyone who has looked us up! The new issue of the Foothills Sentry is out. The Foothills Sentry is a local community newspaper that covers the neighborhoods between Orange and Tustin in Southern California. 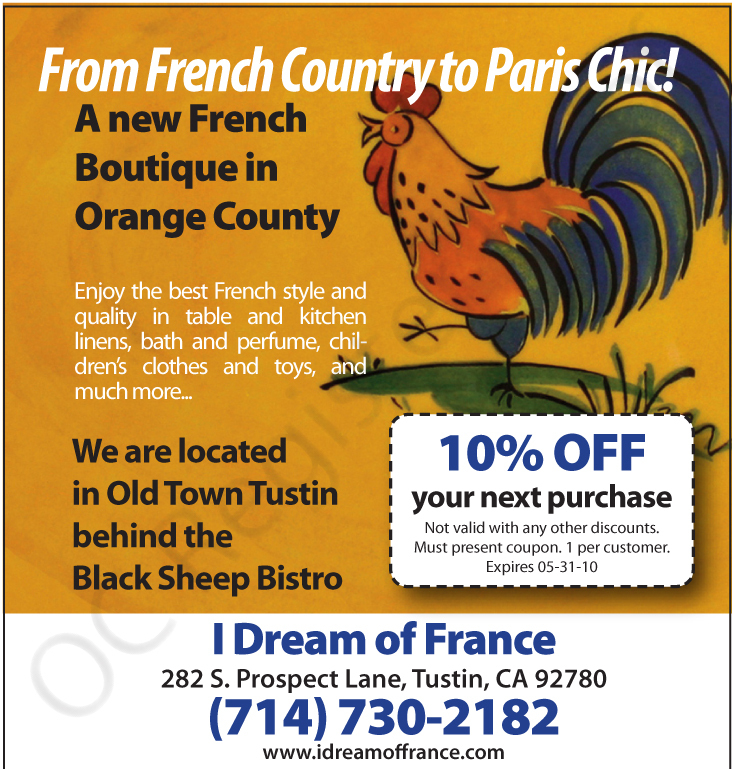 Our ad normally runs in every issue, but this month if you turn to page 10 you will find an article about I Dream of France! You can view the entire newspaper online by going to the newspaper’s web site http://foothillssentry.com/ and clicking on the paper’s cover. We are expanding our advertising reach this week by publishing an ad in two Orange County Register community newspapers, The Orange City News and The Current. The Orange City News covers the city of Orange (obviously) and Villa Park. The Current covers Corona Del Mar, Newport Coast, Newport Beach and Costa Mesa. Our ad is the same as the one we have been running in the Tustin News and the Irvine World News. It will run today in the Orange News and tomorrow in The Current. Take a look and tell us what you think….there is a coupon on the ad too! (Good in-store only, and not online or by phone). Look for our ad in the May and June print issues of France-Amerique magazine This magazine is the monthly journal for French people living in the United States and is written in French. It is available at selected Borders stores and other stores listed on their website. Vive la France!